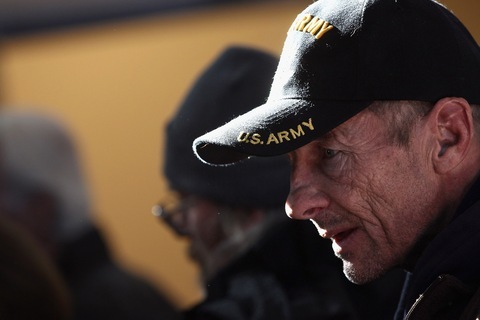 A homeless U.S. military veteran stands in line for free winter clothing at a ‘Stand Down’ event hosted by the Department of Veterans Affairs. Organizers say the homeless veteran population has surged in recent years along with the high unemployment rate. Photo by John Moore/Getty Images. This Veterans Day, an estimated 12.1 percent of the 1.98 million Gulf-Era II veterans (those who’ve served at any time since Sept. 11, 2001, according to the Bureau of Labor Statistics) are unemployed — more than three percent higher than the national average. For younger vets aged 18 to 34, a whopping 16.6 percent are unemployed. In response, the Obama administration rolled out three new initiatives this week to try and help some of these former service members find a job. We look more at those measures in a segment on Friday’s program (and on our Politics page), but we wanted to take a look at another initiative for unemployed vets: a new jobs search tool from the military’s National Resource Directory. Powered by a custom Google search engine, it crawls the web for job openings tagged as ‘veteran-committed’, meaning the employer would like to fill the spot with a vet. It launched Monday with over 500,000 open job listings, according to a White House blog post by Chief Technology Officer Aneesh Chopra. One of the difficulties service members face when transitioning into civilian employment is how to translate their military experience into related, non-military skills. Many pointed to this “language” barrier as one of the reasons veteran unemployment is so high. The Veterans Jobs Bank attempts to make that translation easier by automatically converting the veterans’ occupation code into related and marketable civilian skills. Along with the main site, the NRD has an embeddable widget of the job bank, which you can interact with below, so that the job search engine is accessible on various sites. But as more and more troops come home from Iraq and Afghanistan, any assistance towards finding a job could be a relief. Editor’s Note: Given the Veteran’s Day holiday, we thought we’d re-post one of our favorite vet stories from earlier this year: A Young Vet and His Dog.